Founded in August 1998, Jones College Prep is a selective enrollment, college preparatory high school, offering the best and most innovative opportunities for student academic achievement. Jones consistently ranks among the top high schools in the city, state, and country based on multiple measures of student success. Jones has gone through many changes since opening its doors almost 150 years ago. The original Jones was a grammar school housed in a frame building a few blocks from the present location; it was destroyed in the Great Chicago Fire of 1871. The school was named in honor of William Jones, who in 1840 became the first and later thirteenth president of the Board of Education. He encouraged the education of every child, including girls, a progressive position during his time. A new grammar school was opened in 1875 at 607 Plymouth Court, at Harrison. The grammar school eventually closed, and Jones served a number of functions until 1938 when the Board of Education, recognizing the need for a school that would serve the booming business sector of the city, created Jones Commercial High School. 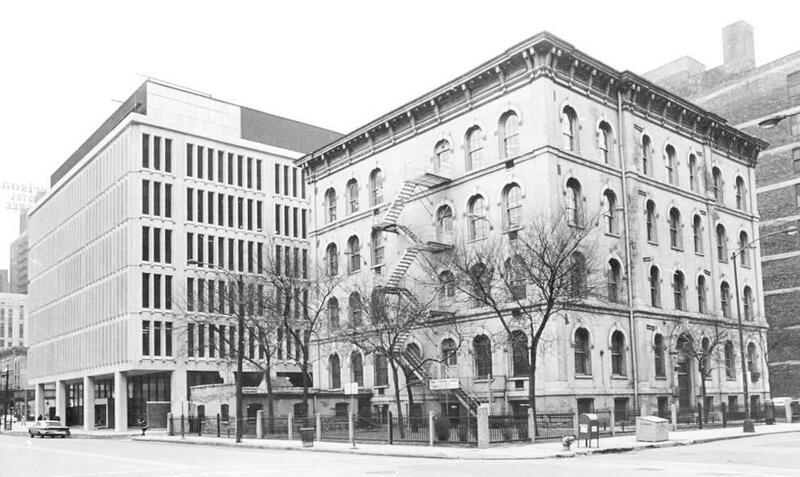 The old Plymouth Court building was demolished in 1966 and replaced by a modern six-story structure at 606 South State Street built to resemble an office building. Jones Commercial’s two-year program qualified “Jonesites” for a wide range of skilled office work. Jones was the first Chicago school to engage in the Cooperative Work-Study program, organized to give students practical experience in their subject and skill areas. In 1982, the school became Jones Metropolitan High School of Business and Commerce, part of the CPS "Options for Knowledge" program. Magnet schools and programs were created to provide Chicago Public Schools students with unique educational opportunities in an integrated setting. In 1998, the business and commerce program was phased out and the school took on its present college preparatory role, briefly becoming Jones Academic Magnet before changing to its current name of Jones College Prep. In 2001-2002, the school was temporarily located at 1450 North Larrabee in the Near North Metro building while the 606 South State building underwent renovation. After Jones returned to the State and Harrison building, the gym and playing fields at the Near North location continued to serve the school for athletics and other activities through the 2014 - 2015 school year. In 2011, work began on a new Jones College Prep building, located at 700 South State. Opened in 2013, the new building was merged with the existing Jones building to increase capacity to an eventual 1800 students. The new South Campus and the renovated North Campus provide students and parents with state-of-the-art facilities that enhance academic, artistic, and athletic achievement. A new library media center, computer labs, gymnasium, fitness centers, pool, and professional-quality theater provide greater opportunity for learning and growth. From its inception, Jones College Prep has continued to grow in enrollment, diversity, programs, and student achievement. It is the most diverse among CPS selective enrollment high schools, welcoming students from all parts of the city and from every race, ethnicity and socio-economic group. The rigorous Honors and Advanced Placement curricula help all students become college ready. Our unique College Knowledge program, initiated in 2008, provides students and parents with hands-on guidance through the college search and application process. In 2006, Jones became the first CPS high school to receive the prestigious Blue Ribbon Award from the US Department of Education; in 2012, the school became the first CPS high school to receive the honor a second time. US News and World Report, Newsweek, and the Washington Post consistently rank Jones among the top five high schools in Illinois and the top 100 in the nation. The Jones College Prep Class of 2011 had the highest college enrollment rate of any CPS high school. The Class of 2016 received more than $31 million in scholarship and financial aid offers.